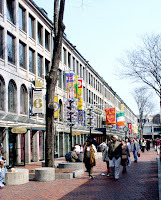 This is a shot of Quincy Market at Fanueil Hall. You can make out the sign for Durgin Park which is a famous Boston restaurant, noted for its surly wait staff, but you can get a good meal there. This area is a tourist destination and usually very crowded, with lots of things going on for the kids and plenty of places to drop a wad of cash in some of the trendy stores. The night life is noted for the twenty- and thirty-something crowds it attracts.